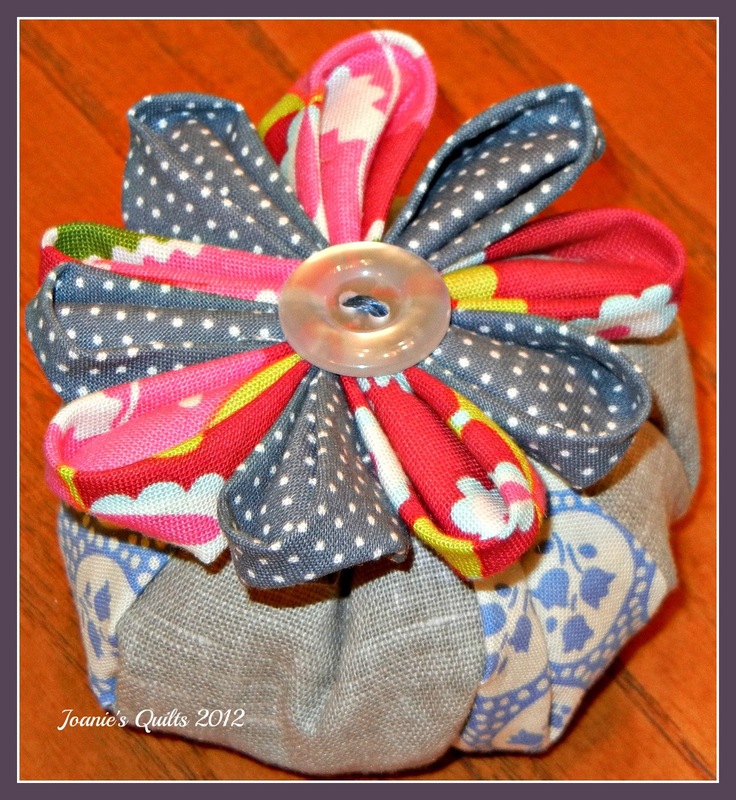 One of two pin cushions made for a swap. I was hoping Karen would love it! She did! This is the second pin cushion I made for Karen! I made one for myself too! The swap project went like this: Using flickr create a picture mosaic of your favorite pin cushions. 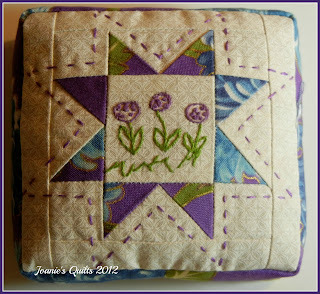 Karen, my swap buddy, requested that she wanted a purple pin cushion. One of her pictures within the mosaic was a pin cushion with a variable star with an inked image of flowers in the center made with a different color of fabric. I didn't have a pattern to follow so I found a similar square shaped pin cushion and used it as a guideline for sizing the pattern pieces. Using Electric Quilt I printed off a foundation for a 3 inch variable star to paper piece and cut borders to size for the top piece. The filler is crushed walnut shells. This is the pin cushion Emily made for me. I LOOOOOOOVE them. Thank you so much. They are wonderful and I have already put them to use this weekend. You do such wonderful work and I will think of you each time I use them. I just love your pincushions! They're pretty and so useful! I hope I find some patterns I like! !